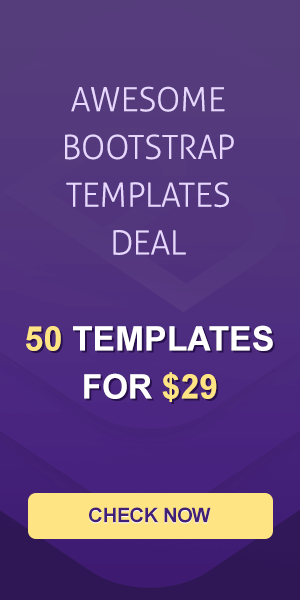 Bootstrap is the biggest web framework that includes lots of options. All of them are user-friendly and easy-to-use. Nowadays Bootstrap gained a huge popularity. For this reason, we decided to gladden you with a collection of Bootstrap admin templates. All of them are made to make your website become powerful. They focus both on the look and functions. You will get a wide range of specific features and customization options. They will allow you to get a tailor-made website. We are sure that you will find a theme that completely fits your needs. In general, these simple but eye-catching admin templates can be called amazing solutions. 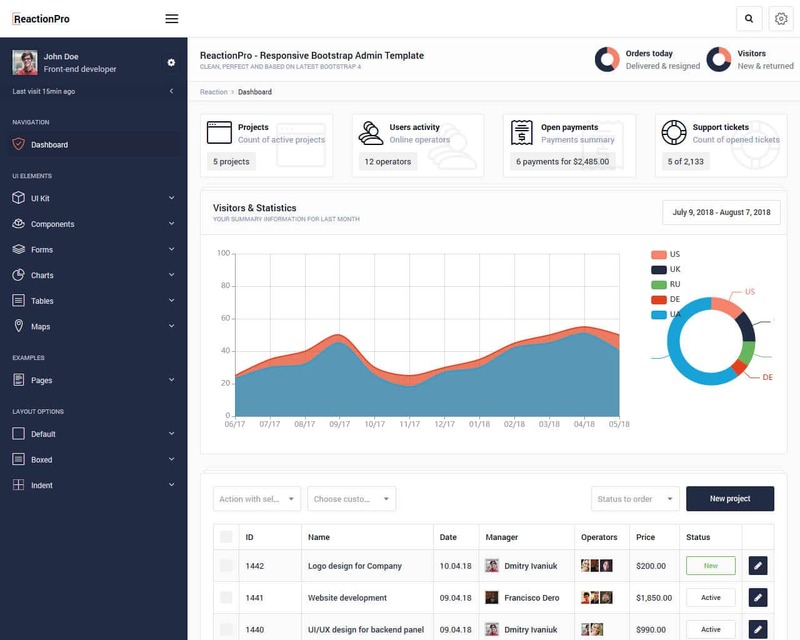 They will suit each online-project which needs an admin dashboard. It will even become a great base for your brand new website. In addition to this, it will allow you to save lots of time and money. We tried to include the most feature-rich themes. They have minimalist looks that will make it easier to browse your online-project. 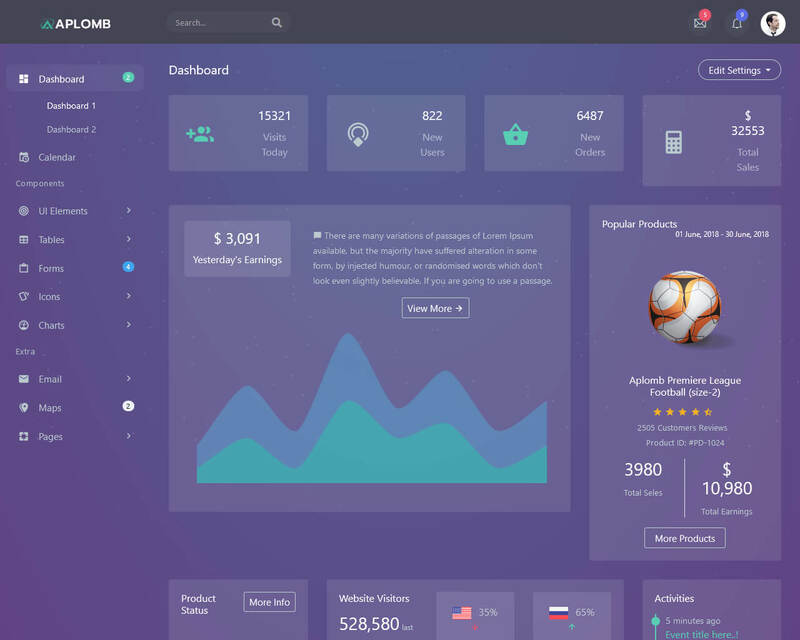 If you want to get a great admin website, you should choose one of these themes. They will assist you in building a professionally-looking website within hours. Who knows? Maybe, you can even call it an excellent one. 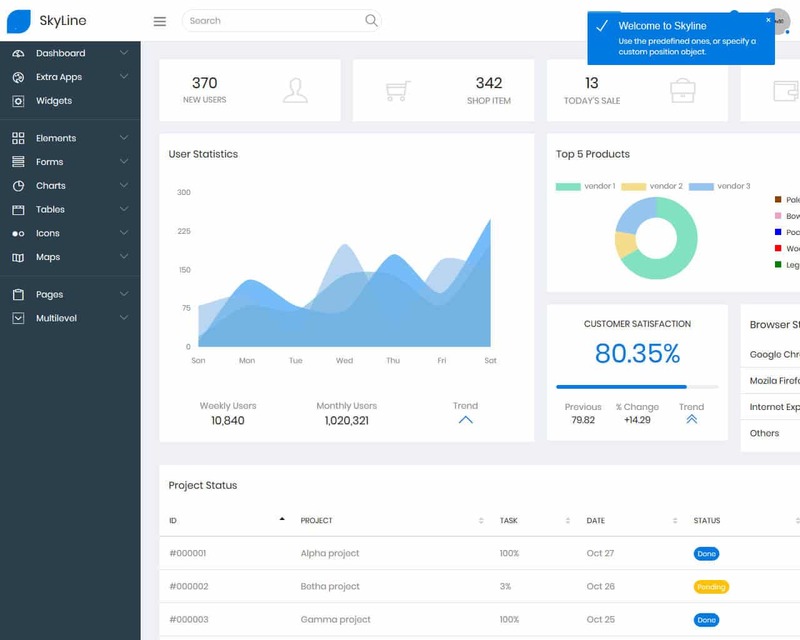 Dashio is a free Bootstrap admin template that is well designed and highly modernized. It is built with all the latest tools that you can find to make it the best template that will satisfy your needs. Dashio has amazing features that are guaranteed to make your project stand out. With Dashio, you will get an already customized template, a well-commented code that is very easy to use when you want to change or add anything. It has a variety of theme colors, and also reusable UI components. Your project startup will be made so easy if you decide to apply Dashio as everything is set and ready for you, well documented and detailed to make your work effortless. Dashio is compatible with different browsers that are available, unlike other templates that limit you to some. These are just a few of Dashio's amazing features. You need Dashio without a doubt. As per the name Nice, the template is justifying the title given and is nice in terms of design aesthetics and clean coding. 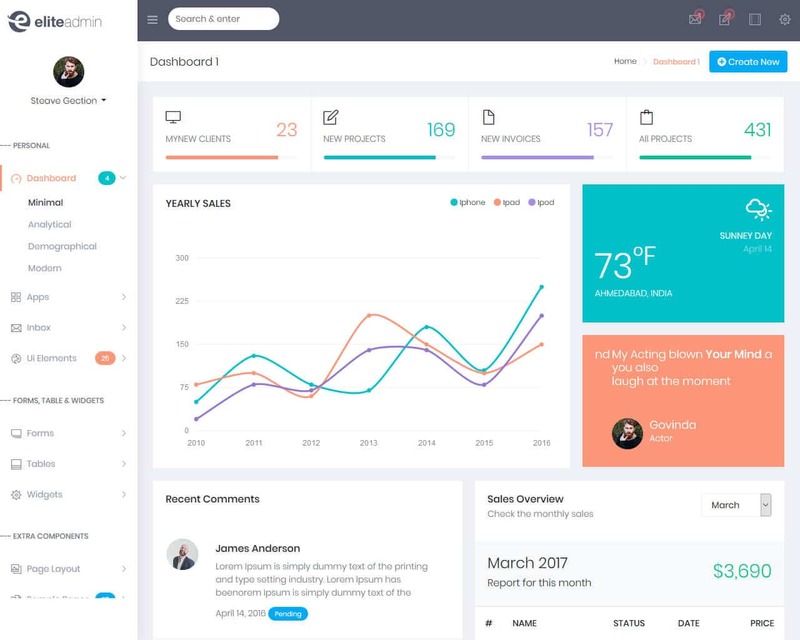 Nice Admin is based on Responsive Bootstrap 4 Framework. 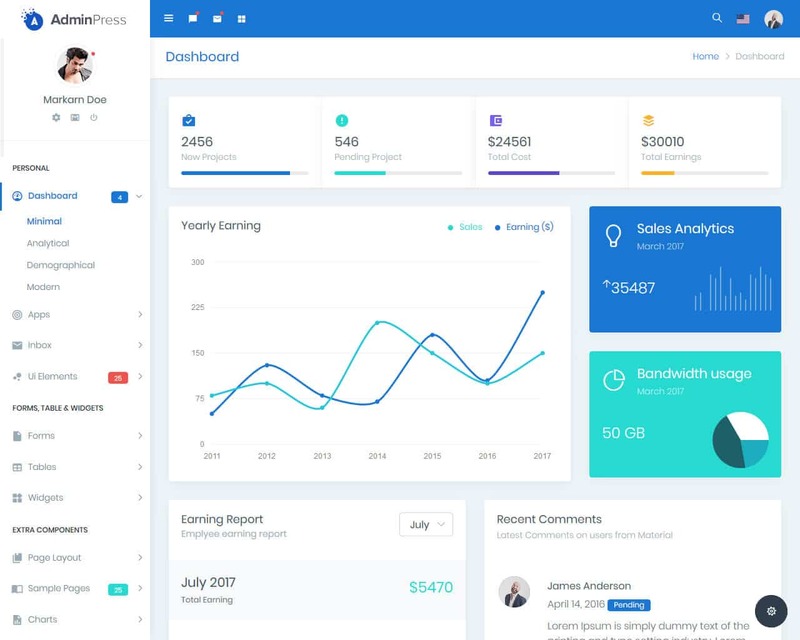 It comes with ready to use 3 dashboard designs, 6 unique demos (like horizontal menu, mini sidebar, right to left, dark version etc) to make your life much easier while you are creating admin panel for your own project or your client’s project. Nice Admin also comes with stunning application designs like calendar app, email app, ticket app, task board app etc to be your perfect choice building kind of applications. Not enough? Well we worked hard and created lots of page examples, table examples and form examples as we know anyone building any application or product, these features are deadly required and we have made sure to include them with tons of varieties. Above all makes Nice Admin Template your first go choice to create your application. Bunny is an attractive and bright template. It can be called an ultimate solution for your future admin website. This theme comes alongside different options. Among them, you can find charts, widgets, forms, and tables. Each component will assist you in building a powerful website. Let us give a closer look at them. - multiple carousels to showcase other content. So, if you were searching for an impressive theme, you found it. It has such a design and functionality that is impossible to pass by. In such a way, you can be sure that your website will have the best look and options ever. Aplomb is a remarkable and impressive theme. It is designed using the most trendy colors. In addition to this, it has an eye-catching and modern typography. Without a doubt, it makes texts more readable and attractive. In such a way, your visitors will certainly get a great user-experience. By the way, you can take a glance at its important features. - excellent pages (rating, highlight, range slider and others). In such a way, you can be sure in the efficiency of your website. It will definitely make people become interested. Make use of it to get lots of attention immediately. Pages is certainly the fastest and most reliable template that you can use to build your app or UI for your admin dashboard. 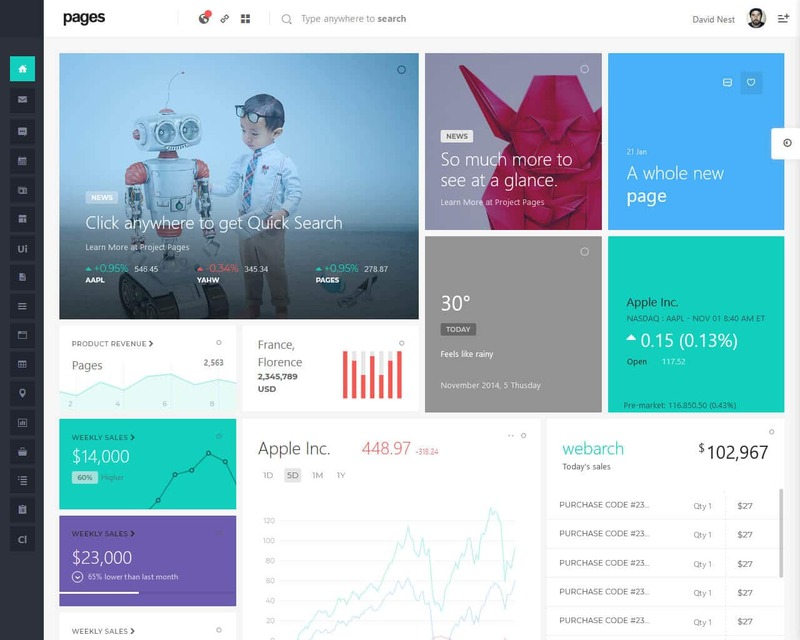 Pages is a smoothly crafted and built with Bootstrap framework. The design has been carefully thought of considering the user's preferences and likes. Pages is perfectly laid out to ensure that your development will look amazing as possible. Pages comes with the most amazing features, and this is what makes it more unique than all others. With pages, you can be guaranteed a clean, well commented and organized code that you can use effortlessly to edit whatever you wish, and it comes already customized, 6 color theme and language sidebar, it has a simply white layout that is purposed to combat stress. Pages makes your work very easy as you can actualize your online development in less than 2hours because most of the work is done. With the page template, you can expect nothing less but growth. Xtreme Admin is powerful template anyone can see till now and the reason behind saying the most powerful is because the features and options it carries with that. 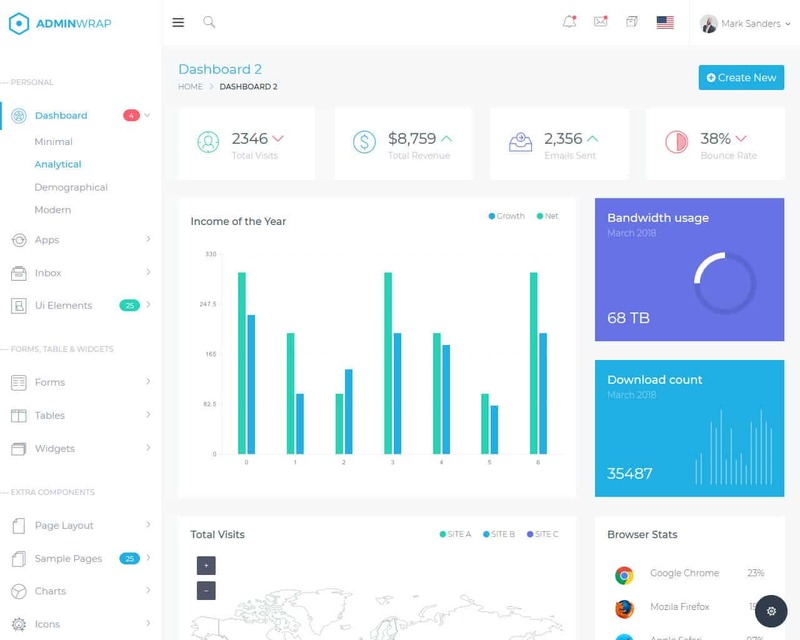 just to name few, it comes with 10+ unique dashboards, which includes Sales Dashboard, eCommerce Dashboard, Famous Crypto Dashboard, Analytics Dashboard and much more, so whatever you are building, we are damm sure that above dashboard variations will surely fit to your needs. Also it comes with lots of demo variations, so if you are looking for having horizontal navigation for your project, you are at right place, if you are looking for mini sidebar, you get that too, so lots of options available to make your life much easier. It also have Right to Left (RTL) version included. It comes with lots of page templates, ready to use application designs, unlimited color options, 3000+ font icon options, 500+ UI Elements, 100+ Integrated plugin and much more. So what are you waiting for? Grab your copy now! 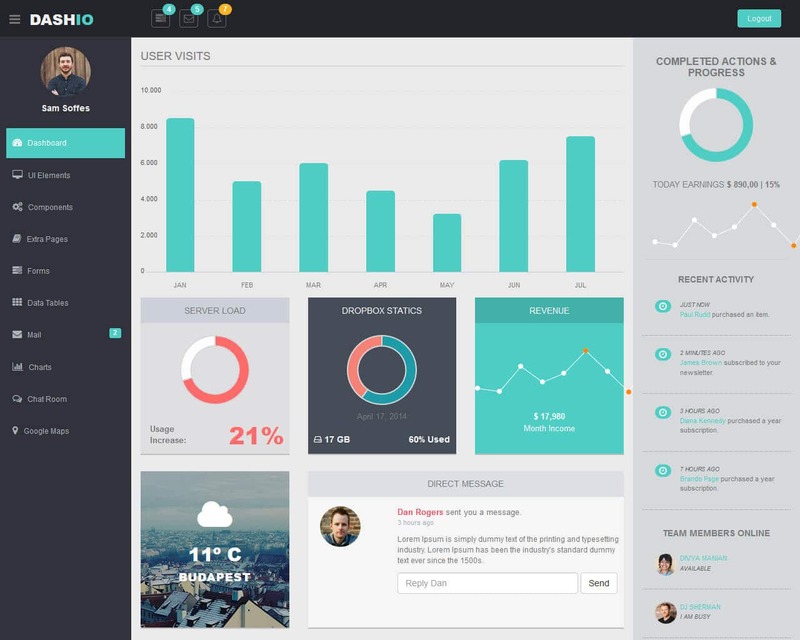 Elite Admin is a Bootstrap framework premium template that has a very flat design. It is lightweight which simply means that it does not consume much internet because it loads easily and fast. It has a wide collection of reusable UI components. You can use it for so many sites like web applicators, backend, CMS or CRM. Elite Admins comes with a very organized code that you can easily use. It also comes with a great starter kit that will help you a lot for the first time. Your project can become a success with the use of Elite Admin as it has all the necessary features. Using Elite admin dashboard without a doubt will be very relevant, and you can now fully rely on it to achieve your target. You will get a variety of user applications that you can easily use for the development of your next project. 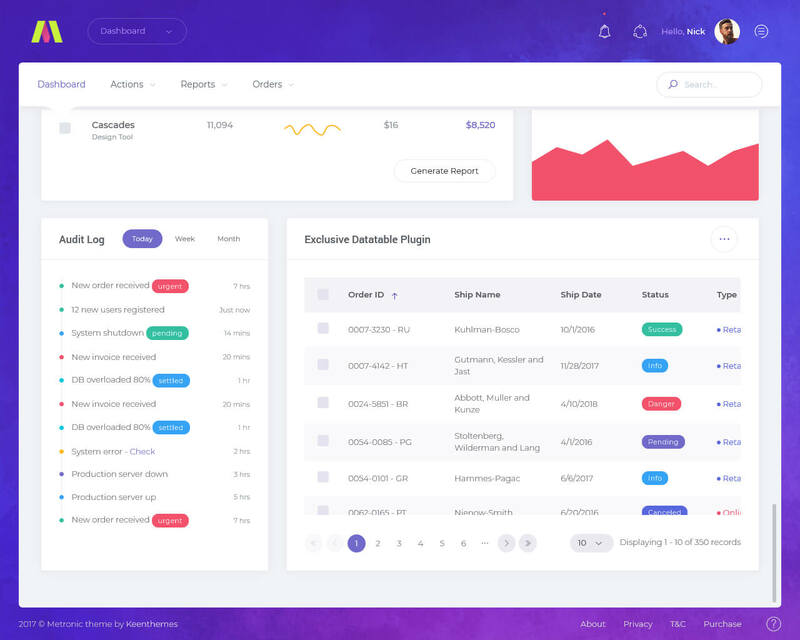 Monster Admin is based on modular design, which helps you to build your project much faster, as it comes with ready to use widgets, so you can just copy the code of section you like and put in your project to get desire results. It is built on most popular bootstrap framework, which is ultra responsive and works in all devices. 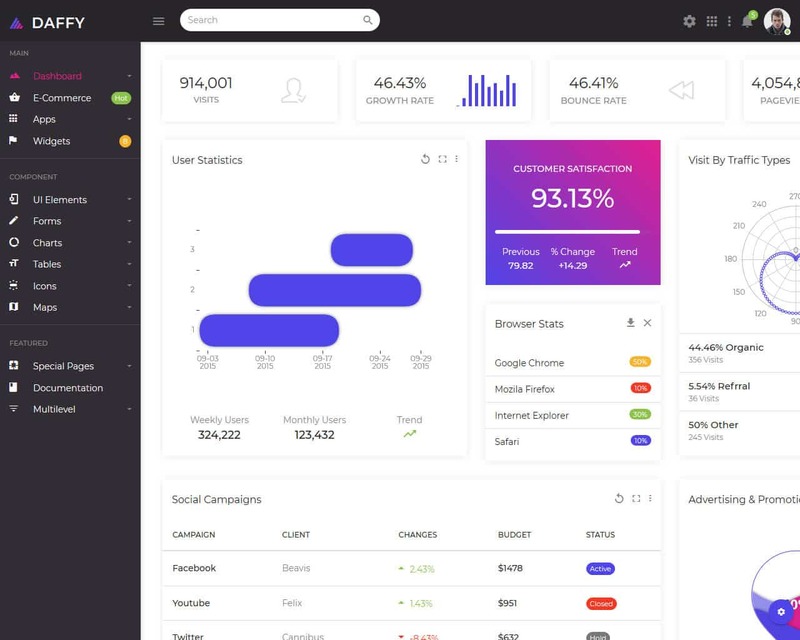 Monster Admin comes with few dashboard variations, unique demo versions, 100+ integrated plugins, 500+ UI Elements, 3000+ Font icons and lots more to be your life saver while making user interface for your project. It also comes with some ready to use application designs and form + table examples to save your tons of time and money. Grab the opportunity to save your time and money with Monster! 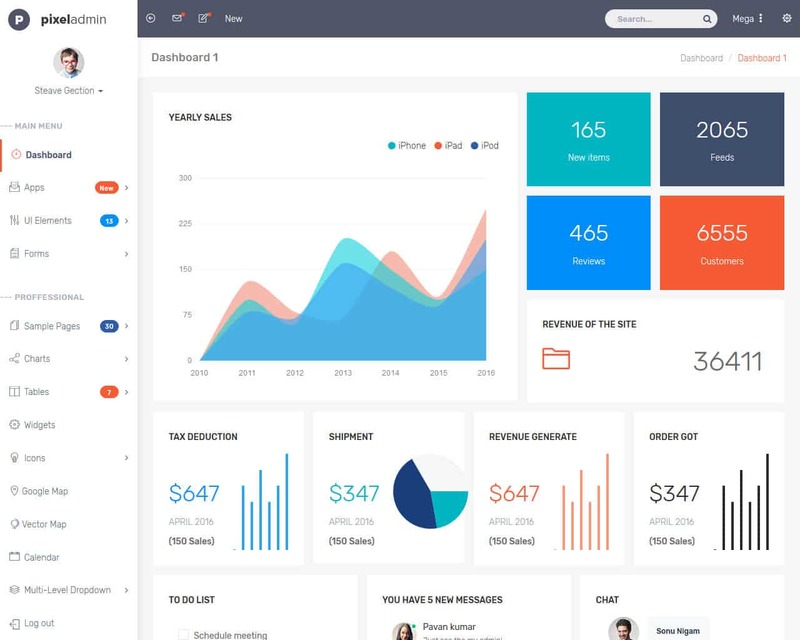 Modern admin is a super flexible, clean, powerful and modern Bootstrap admin template. It comes with unlimited responsibilities. It can be used for almost any type of web applicators, for example, eCommerce backend, project management, analytics, CRM, or any other custom admin panels. 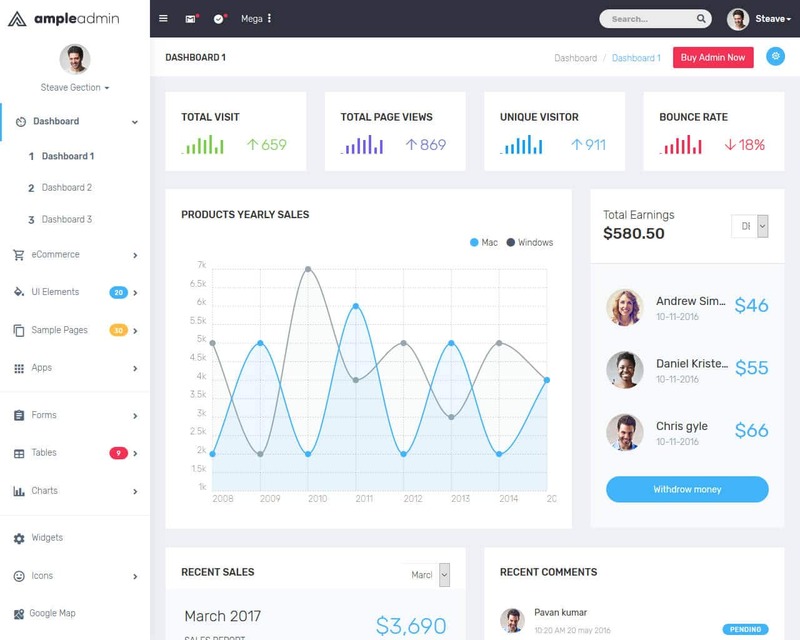 Modern admin comes with a clean and perfectly commented code, seven templates that are pre-built and have an organized folder structure, and it has 1500 and more pages, 1000+ components, 100 charts and above, widgets and so many more amazing features that will go hand in hand with your project. With Modern admin comes a starter kit that will easily guide you to a quick and easy start. This template comes with very many useful applications that will help you in your next project. Modern admin will give you endless features that you can apply successfully and you will have a great user experience. 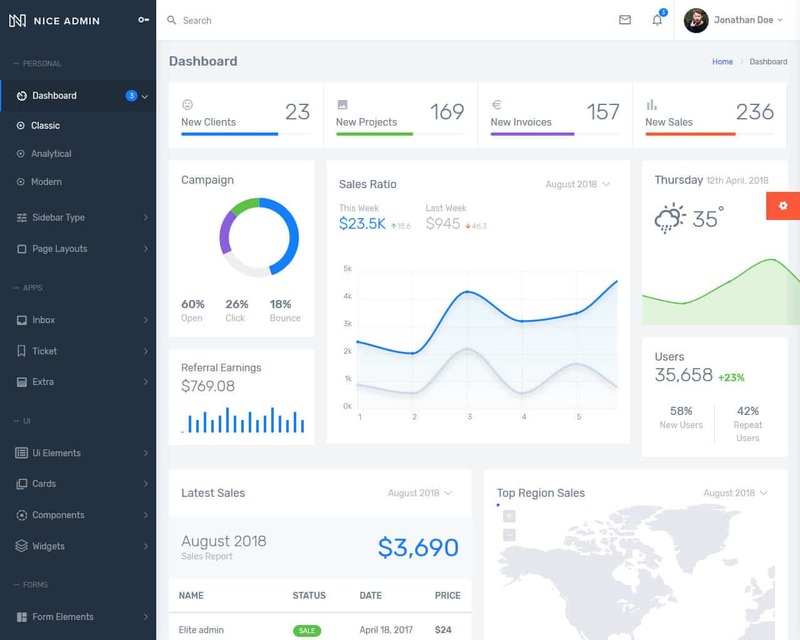 Admin press is a premium and full-featured admin dashboard template that comes with a flat design. It is created with Bootstrap framework. It is integrated with the trending jQuery plugins and has a great collection of reusable UI components. It is suitable for all web applications like app backend, custom admin panel, CMS or CRM. Some of the admin press amazing features are, 4different dashboards, 5 different demos, megamenu, lightbox, dark and light color schemes, 500+ UI components, a modern and clean landing page, 6 predefined color skins that you can easily change as per your preferences, lots of widgets, and it is also very easy to customize. It also has a very clean, organized and well-commented code that you can work with effortlessly. Any developer can use this template to take their projects to the next level. A bright template that can be called your great choice. A bunch of online-project will become better thanks to it. It has such a big number of options that you will be impressed. We want to show off them in the list. You will find the most important ones below. - an impressive number of pages. As you can understand, a number of functions is really big. This means that you will get an amazing functionality. Furthermore, this theme has a good-looking design. Just imagine this mix. If you want to get all of this, get this solution right now. 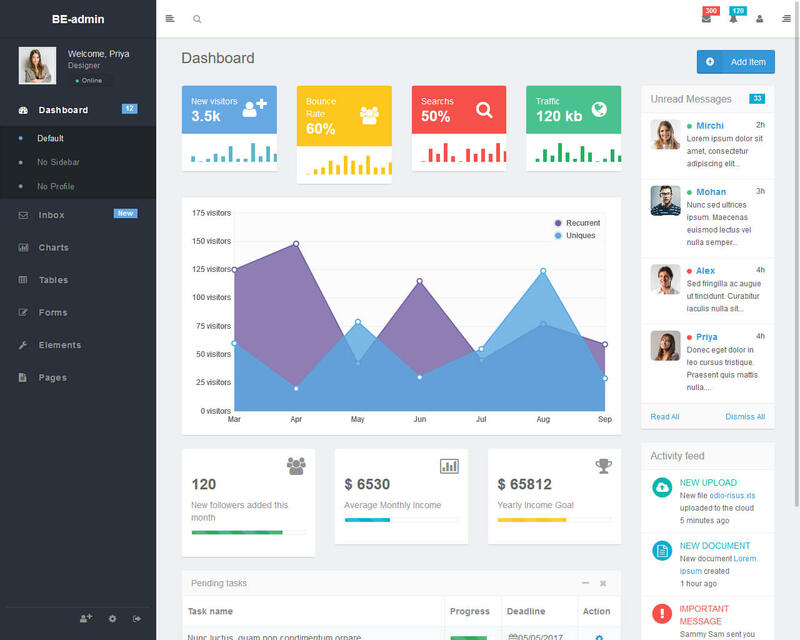 Elegant Admin Template is based on Bootstrap Framework and elegant in design and easy to customize in coding. 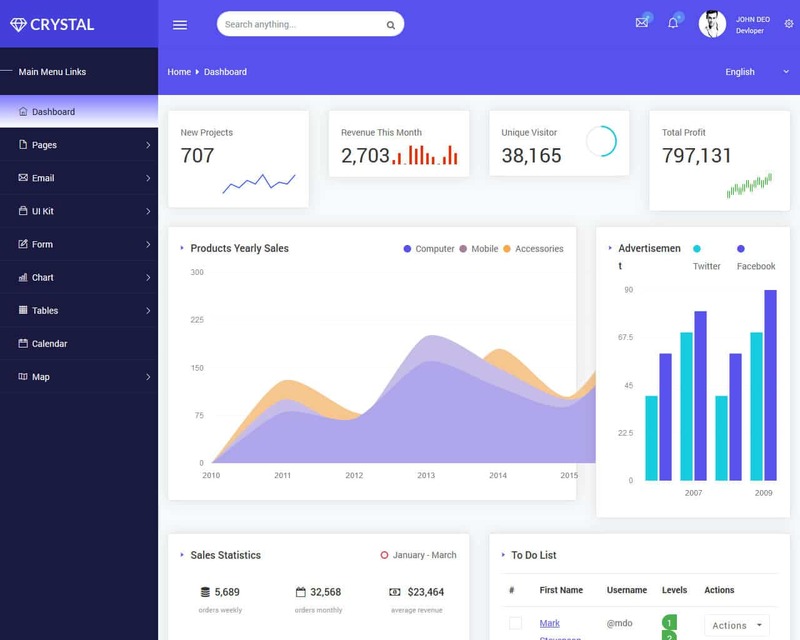 Its static html template, which helps you to build your own application faster by using ready to use dashboards, applications and page templates designs. We made sure to have all code errorless and design to be ultra responsive. It also comes with free lifetime updates and 1 year premium support. 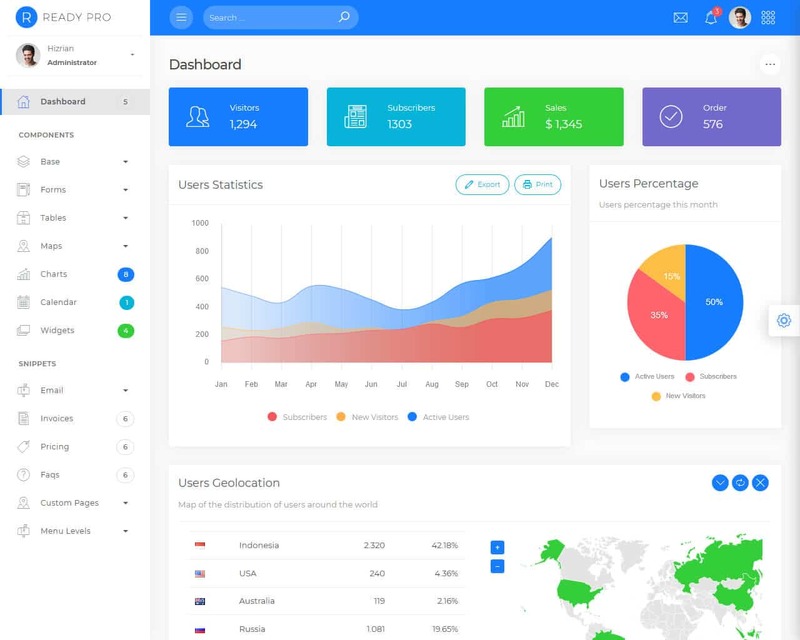 Elegant admin contains lots of ready to use elements like tables, forms, charts, widgets and much more to relieve your headache making stunning user interface for your projects. MaterailPro, as per the name Material, it is based on Google’s Material Design, which makes it different from other available templates and make it most saleable as well. The famous material design allows you to stand out in competitive world and bring fresh look and feel for your project. It is one of the best selling admin template of all time and we assure you that it will surely bring life to your application or project. It comes with strong design variations to help choosing the right design options for your project, also it has tons of options available for elements, which is helpful while you are creating forms, tables etc for your project. To add to this, it comes with Premium support for 1 year and free lifetime updates to give a real great value to the product. We recommend you to buy this one. 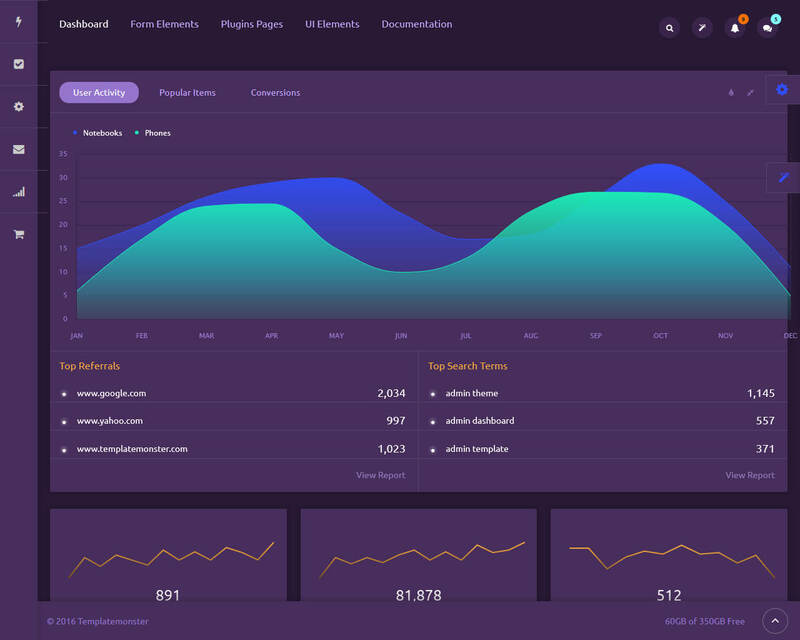 Fuse is a Bootstrap framework template that has incredible features fit for your admin dashboard and many other web applications. It has a very beautifully commented code and is also well organized to make it easy for you to edit and so much more. 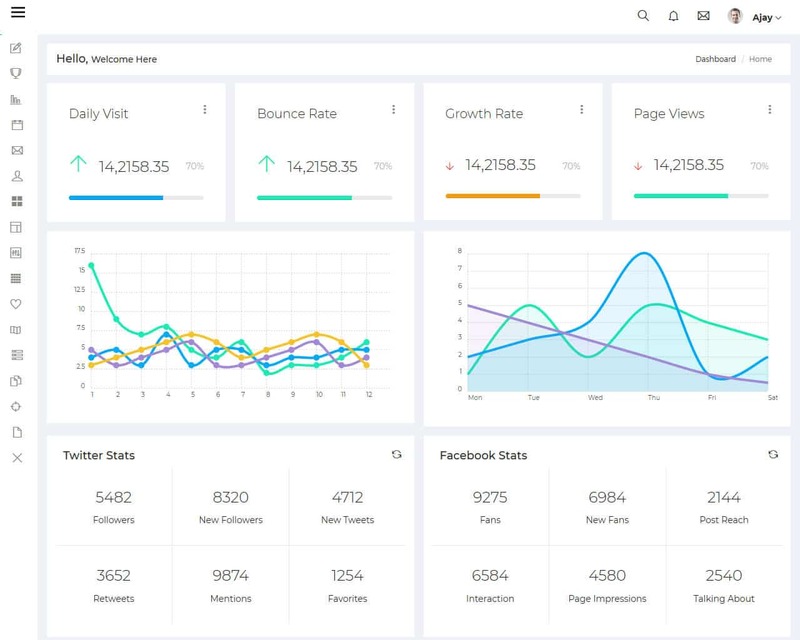 If your interest is more focused on creating an online admin dashboard, eCommerce backends, web application backend and more, Fuse will work well in doing so. It comes already customized and has widgets and font awesome. Fuse will improve your site and help it to stand out as it has a very beautiful design that will attract an audience hence increasing views that will take your site to a bigger level. Fuse can help your development to grow to the next level. It is compatible with almost all browsers, for example, Firefox, Google, Chrome and many more. It is very modern and highly detailed specifically to meet your expectations. A powerful minimal template. It was carefully crafted to impress your target audience. Your website will be displayed correctly on all possible devices. This means that you do not need to worry whether people will enjoy your online-project. They can browse it using desktop and mobile versions. Of course, they will get a pleasant user-experience. What categories can you find on the package? You can be sure in user-friendliness of the website if you choose this template. It includes lots of amazing options. Without a doubt, you will be happy to get such a power and flexibility in one single package. By the way, you can make use of the RTL version of the template. If you want to save even more time, this variant will be your ideal assistant. Grab it right now to become successful! Clean is the word to describe AdminWrap Template. If you are fan of minimalism, AdminWrap is the perfect choice for you. Its awesomely clean in design and ultra responsive + easy to use in coding using bootstrap 4 framework. It comes with several design options for your to choose the best fit for your application user interface. You dont need to worry about any coding errors as it comes with 1 year premium support to resolve bug you found in template in no-time. Also there is free lifetime update to stay ahead of your competitors with latest upgrades. Love clean designs? Grab your copy now! 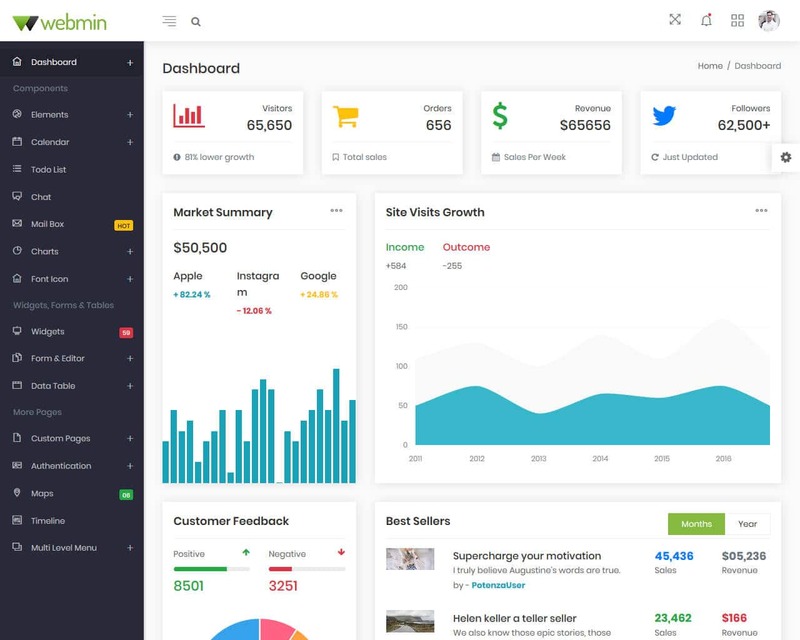 Webmin is a very strong and light template for backend admin panels that are based on the Bootstrap admin dashboard. It also has a great core which is angular 5 framework. It comes with 20+ angular components that are ready to use, a variety of unique dashboards, 50 and above page templates, and many more features that will suit your backend applications. You can easily customize the Webmin template as the design allows it. The designer used the latest Bootstrap version so that you as the developer can get flexibility and fast ways for layouts. Webmin has 50+widgets, a dark and light sidebar, a mailbox, chat and many more that are necessary for your project. The fact that Webmin is very detailed in documentation will ensure that you can easily use it and easily and effectively. Old is gold, Ample Admin makes that quote true as its build on little old bootstrap 3.3.7 framework. But we found that, there are still lots of people who like that version of bootstrap and still using that. So for people who like the old, this is the best gift you can ever get. It is just old in terms of bootstrap version, but in terms of design, its very modern, flexible and user-friendly, which makes it even deadly combination for those who are looking to work on older version of bootstrap, but want still great looking for their application. 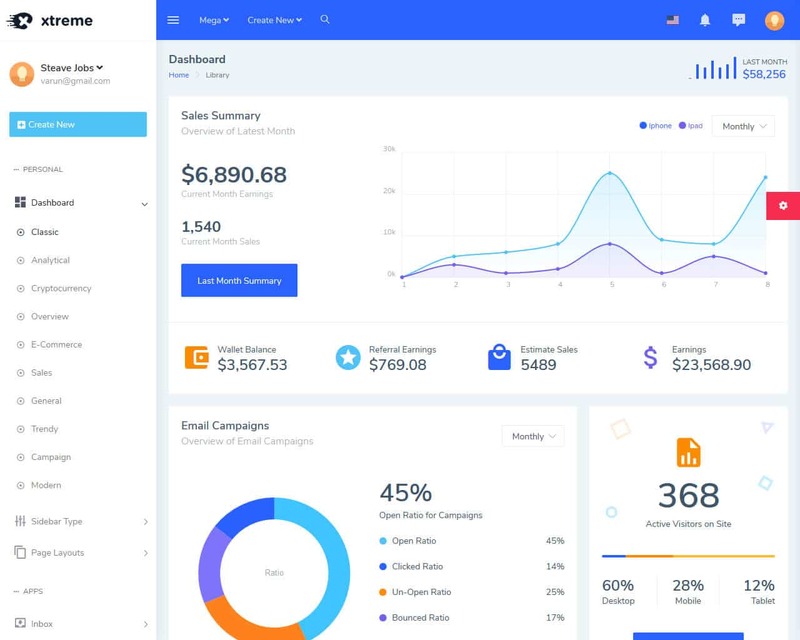 Ample Admin template is available with Minimal look as well as Colourful look, which make is the best choice for people looking for different styles. It also comes with 1 year support and free lifetime updates to add tremendous value to it. A great user-friendly template made for everyone. Even those people who have nothing to do with coding can work with it. To cut a long story short, it has a wide range of necessary options. Among them, you can find the most popular ones. Let us present them to you. - remarkable forms, charts, and tables. All of these features and many others will allow you to build an excellent website. It will turn you online-project into an attractive one. Without a doubt, you will get your piece of popularity. Make your website shine together with this solution. 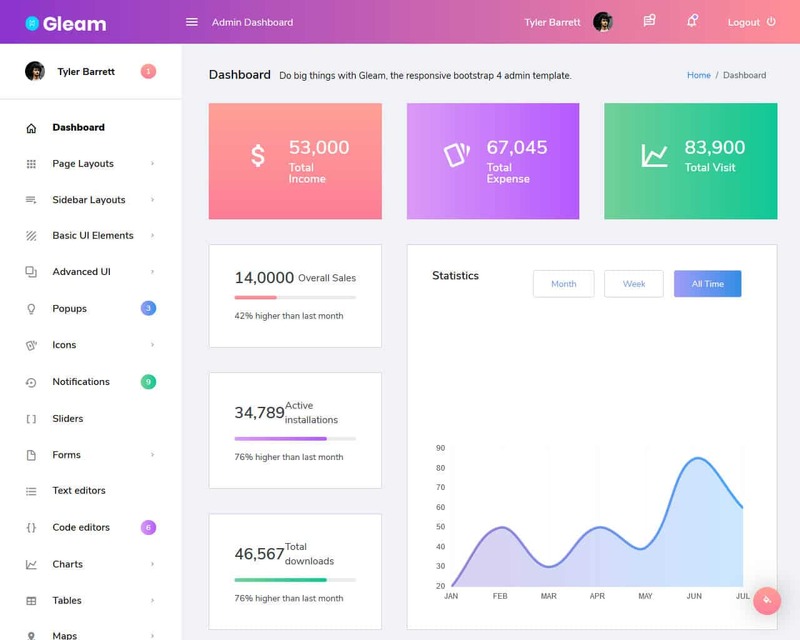 Gleam is a full-featured Bootstrap template, and it is a multipurpose admin template that is ideal for all developers. 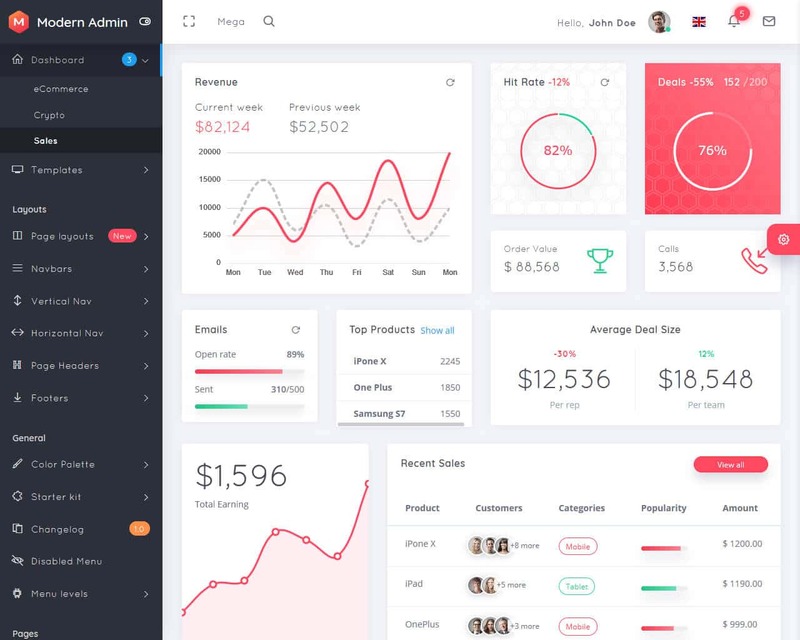 This admin dashboard template comes with a lot of reusable UI components and plugins. 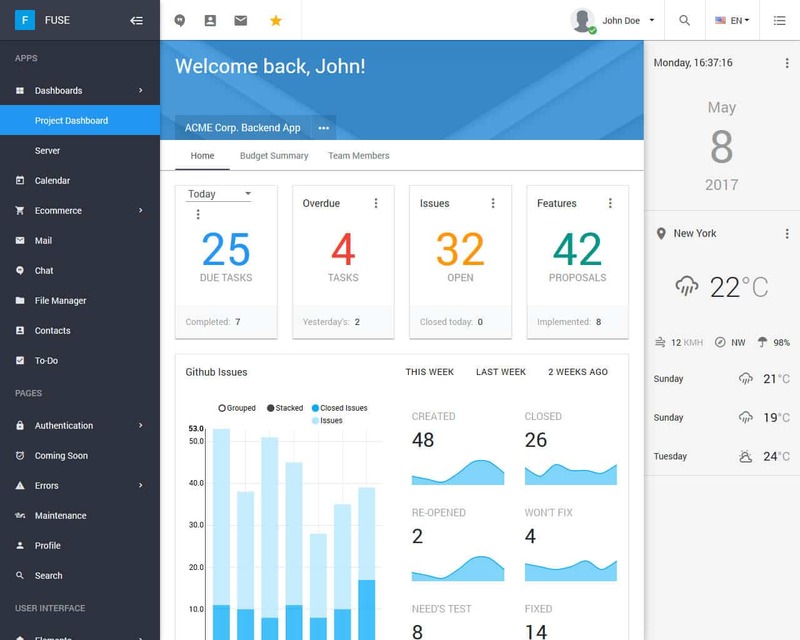 Gleam is one of the best and most reliable admin panel templates. With the use of Gleam, you can start your project easily and quickly complete is successful. You do not need to waste a lot of time and energy starting from scratch while you can simply use this admin panel template. Your application will certainly follow the best channel in performance and usability as it is crafted based on Google material design. Gleam works seamlessly on all browsers as it is compatible. You can use Gleam to build all types of web applications like web application backend, eCommerce, backends, admin dashboard, and many more. This will highly accelerate your development without consuming time and money. Pixel Admin is playful dashboard template to build super awesome user interface for your application. It is built on Bootstrap 3.3.7 framework, which is responsive and works best in all devices. 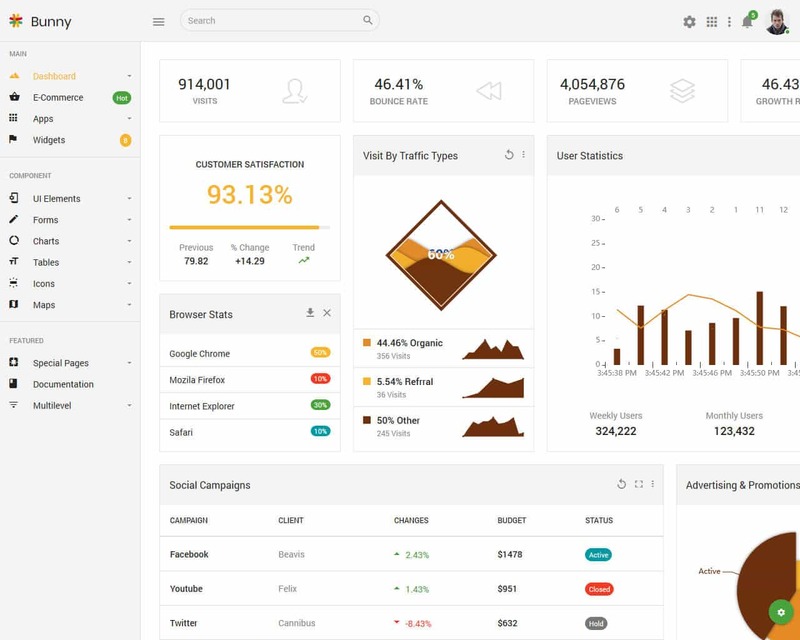 Pixel Admin comes with some super designed dashboard variations and ready to use demo options. It also includes very useful pages templates to help you create your application faster. Premium Support for 1 year and free lifetime updates are included within the purchase, so if you are facing any trouble, customer support will help you to solve the problem. A sophisticated and nice-looking theme. You will get the opportunity to build your website in a flash. There is a great number of projects that you can launch together with this solution. A professional real estate business, loan management system, eCommerce, and many others. All of these topics and many others will get a fresh look. In general, you will get many features to achieve your success. - a powerful Google Map to show a physical location if it is needed. If you take advantage of this theme, you will hit the target. All of its components will allow you to build a visually-attractive website. Do you want to win the hearts of your core audience? In this case, feel free to get this theme here and now. Daffy is an elegant and stylish theme. It will take you completely nothing to work with it. Its flexible nature will provide you with a simple process of customization. You can work with various elements to launch a tailor-made website. It will allow you to stand out from the crowd and impress everyone. Actually, the package has lots of amazing features. Yet we will present to you the most widely-used ones. - amazing pages to present all necessary information. You can be sure that your website will become widely-recognized. Thanks to the design of this theme, people will adore your online-project within seconds. Make use of it in order to build your website in a fast way. Do you dream of getting an impressive and unique website? Do you want to work with colors, fonts, and other elements without any difficulties? In such a case, we offer you to choose this variant. Thanks to it, it will be possible to create a website in the short run. Each kind of the project will play out in fresh colors. If you want to get assured, give a glance at its features. - a huge number of widgets to give more power to your online-project. If you want your potential readers to become interested, pay attention to this solution. It will give you the opportunity to get more and more visitors. Your website will become more popular and turn into a huge attention-grabber. Do you want to save your time and money? Then, you need to grab this solution immediately. Thks marvelous theme will catch the eye of every possible person. It will definitely meet all your needs. Why do we claim this? For the reason that it has an eye-catching design. It will win the heart of all visitors of your future website. Moreover, your online-project will have a powerful functionality. There are a few crucial details that will provide you with it. - different components to make sure in your success. This package includes only the most essential plugins. In such a way, your website will not be cluttered with some unnecessary features. It will be loaded extremely quickly. So, if you want to create a panel for web applications, give a look at this variant. It will become your key to success. A wonderful and tailor-made template made to draw an audience. Together with this powerful theme, you will get lots of advantages. To start with, you will get a nice-looking design. It will definitely make other people become interested in your online-project. Furthermore, this package includes a wide variety of fully-fledged options. They will make your website stand out from the crowd. Let us present to you these very options here and now. - lots of customization options to distinguish your website. If you take advantage of this template, you will get your recognition. For this reason, you should set your eyes on this great variant. It will assist you in launching an out-of-the-ordinary website without any efforts. So, if you want to save your time, take it right now. 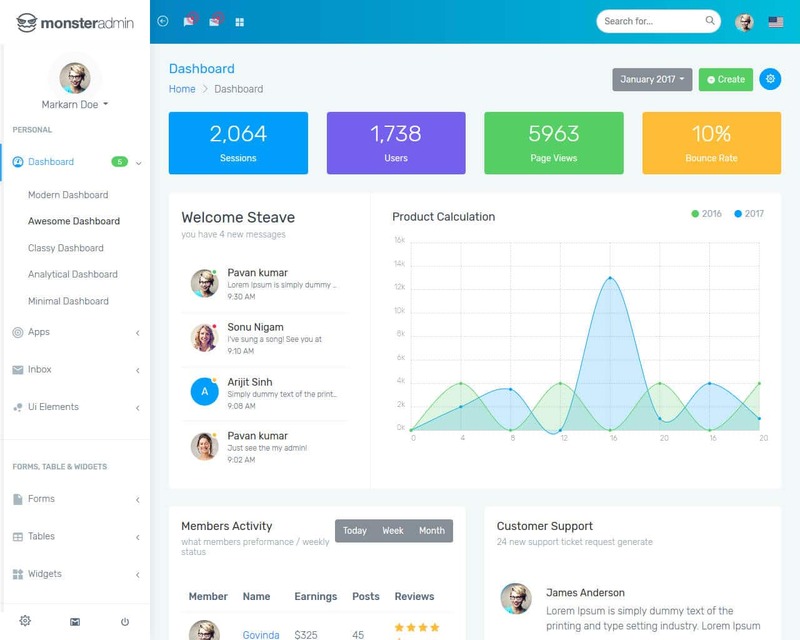 Metronic is one of the best-selling admin dashboard templates. It has a high and robust design. 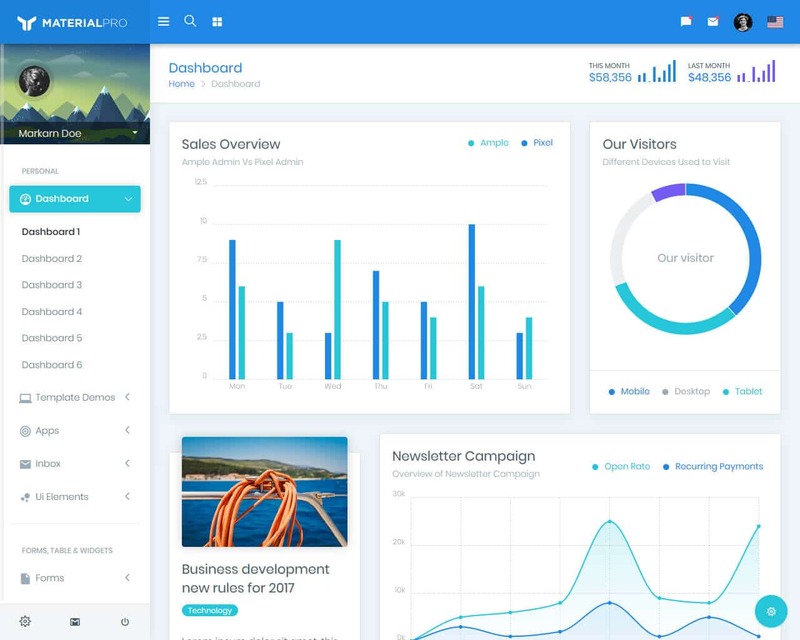 It has a positive and solid user experience for admin panel dashboards. It is easily customized, integrated and deployed. One of Metronic core is the integration of Twitter Bootstrap framework. It has flexible fonts, images, and also a great layout. These amazing and also useful features make your admin panel dashboard relevant and reliable in the current mobile-first standards. Its fantastic design can allow the layout to fit on all screen sizes from one website as it has flexible grids and layouts. Metronic is designed for the specific use of administrators and developers. Its layout comes with different design features and functions that are all suitable for you. It has a wide variety of elements and components that developers can use to populate and customize their dashboards.